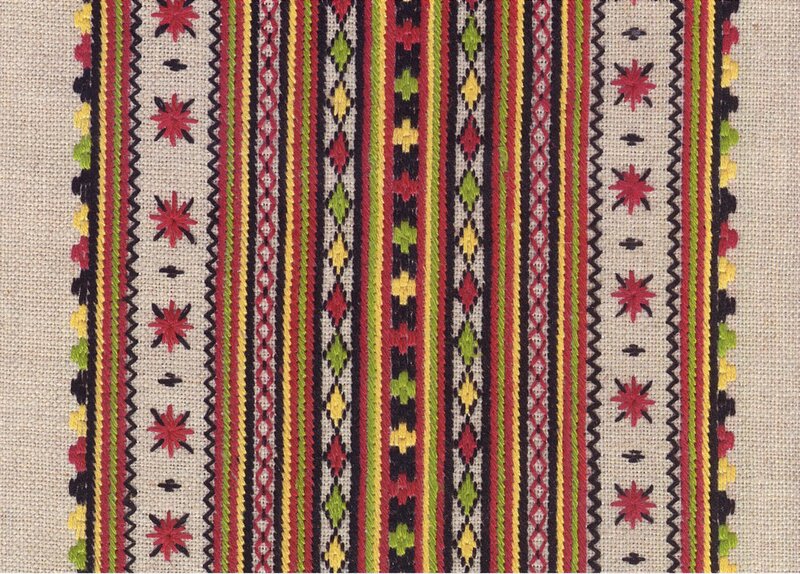 Today i will continue the discussion of Javoriw [Yavoriw] costume by focusing on the embroidery. 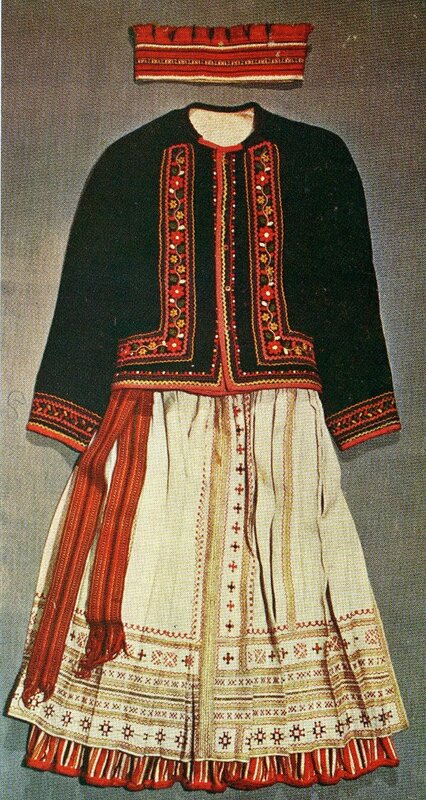 The oldest embroidery on the apron, linen kabat or kamizelka, and the chemise, is based on back stitch, counted satin stitch, and cross stitch. This was done in waxed linen thread, which was yellowish, and black, often with some addition of red, but not always. Here is a close up of an apron done only in hemstitch, waxed linen thread and black. 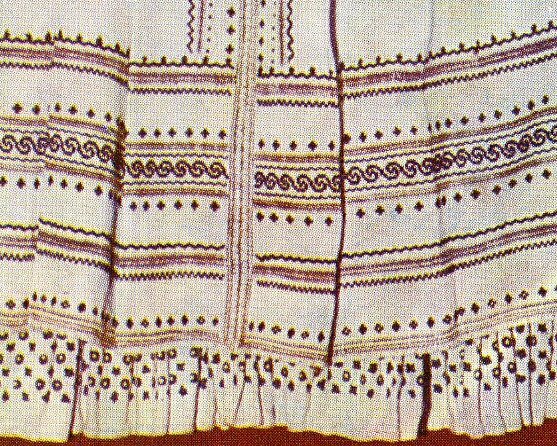 The hem of the hand printed skirt, maliovanka, shows beneath. Here are a couple of other aprons, done mostly in cross stitch. 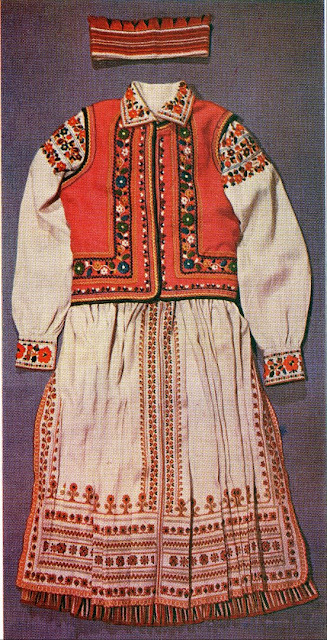 You will notice throughout that the costume pieces have compositions which are in rows, seperated by lines of back stitch, hemstitch, or herringbone. 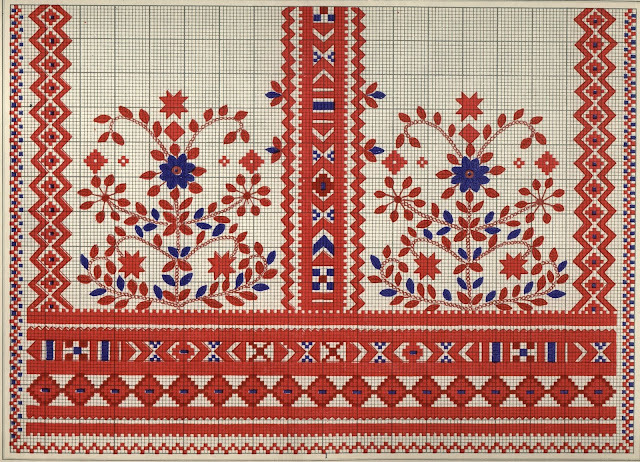 This first one has fewer rows than usual, The embroiderer may not have wanted to spend the time, or perhaps planned on adding more later, and never got around to it. 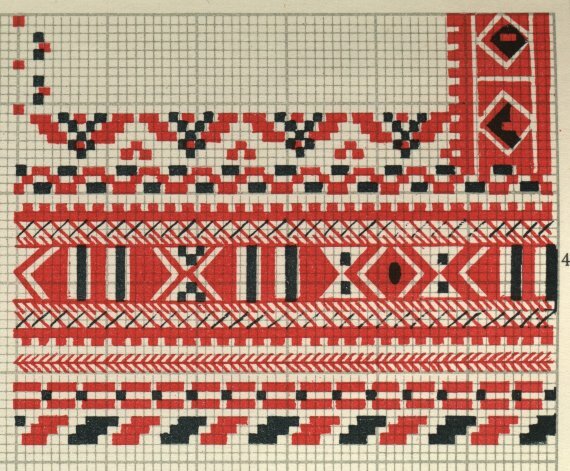 The following one has large designs in the top row, which is sometimes done. There are more examples of apron embroidery in the first posting. Here are two more examples of the type of embroidery done on the linen kabat or kamizelka. There are others shown in the first posting. 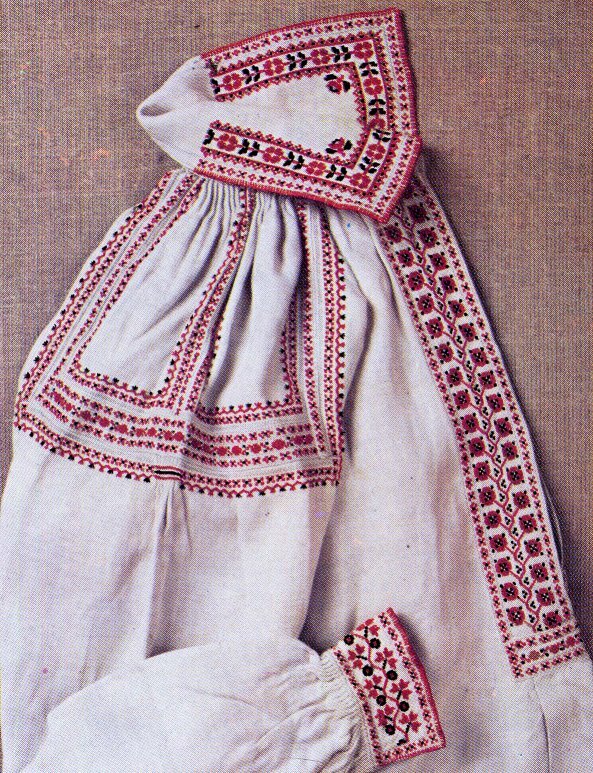 This type of embroidery was also done on the chemise. 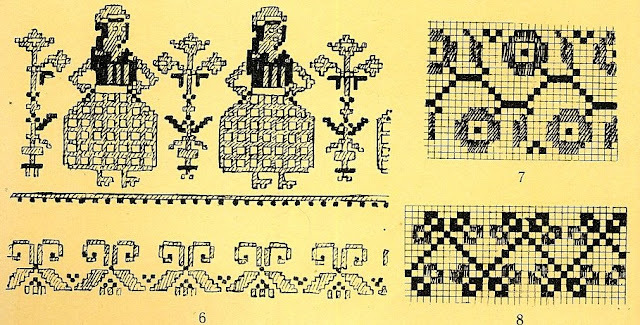 Kul'chytska sketched a couple such designs during her travels. 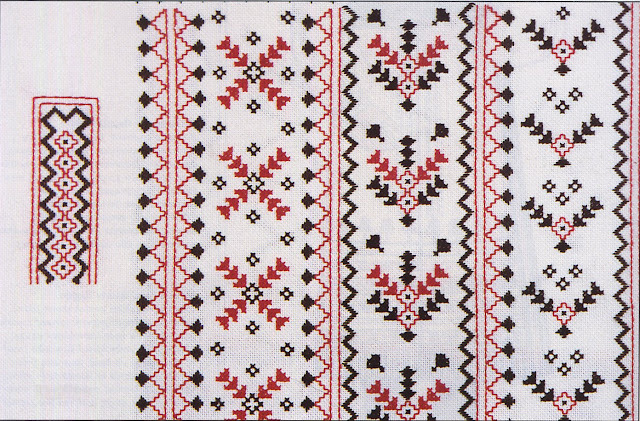 These are intended to indicate cross stitch in black and red. Here is a woman's chemise [sorochka] done in this style of embroidery. 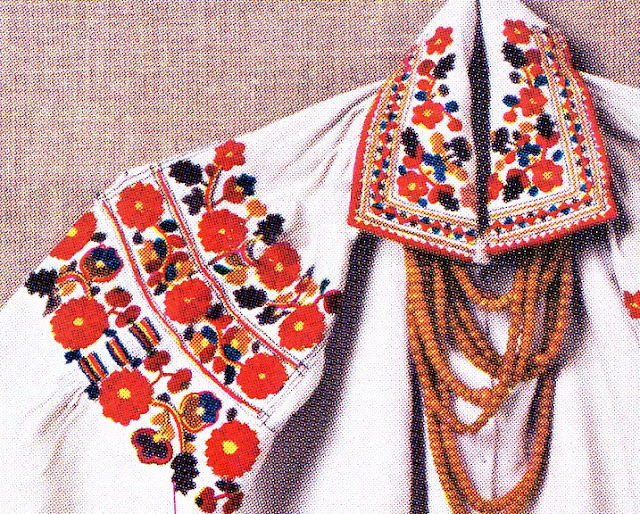 Unusually, this sorochka has embroidery around the front opening, as well as cuff, collar and shoulder inset, [ustawka]. 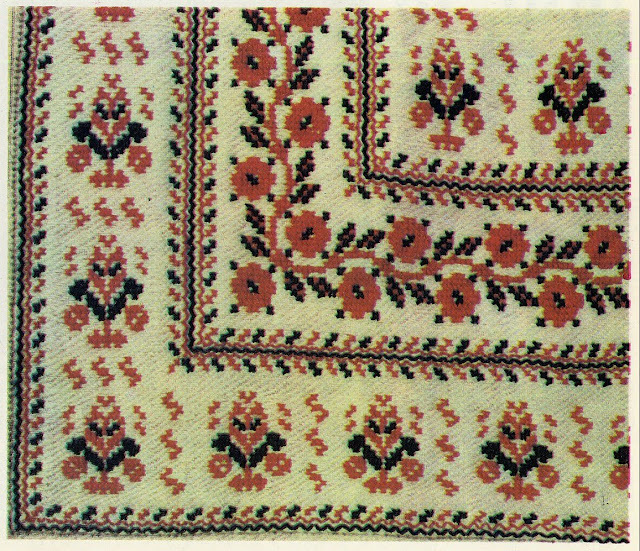 As is often found in Halychyna, the shoulder piece is not only embroidered in a wide band along the bottom edge, but along the sides, and in a stripe up the middle as well. 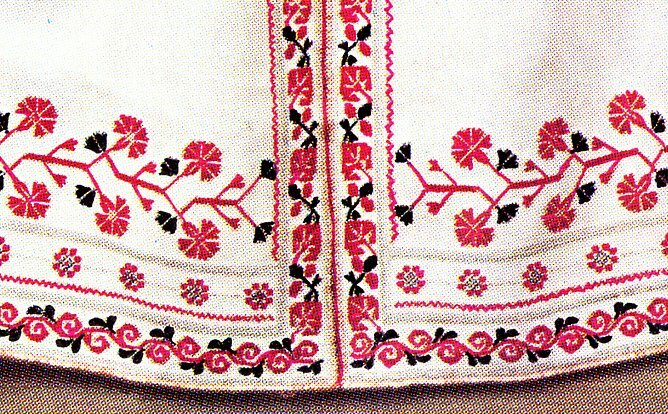 There is a narrow strip of embroidery along the top of the sleeve, interrupted in the center where the cloth is gathered, and smocked in lines of the same colors as the embroidery. There is also a narrow band of embroidery on the front and back body pieces, along the seam, echoing the embroidery on the edge of the shoulder inset. This is often found in Halychyna as well. The seam is emphasized instead of being hidden. 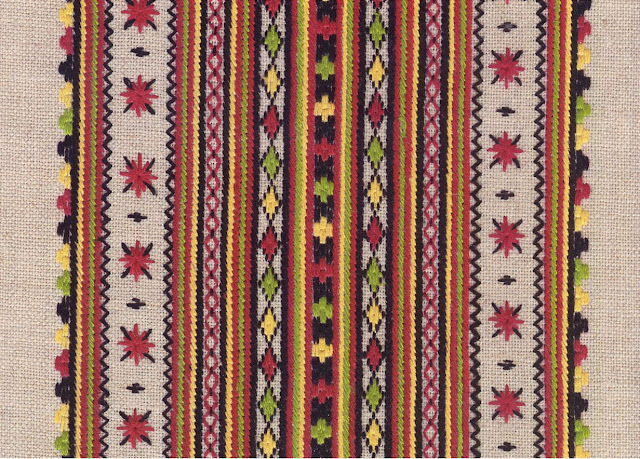 The second type of embroidery done in Javoriw [Yavoriw] is simply called Javoriw Embroidery. 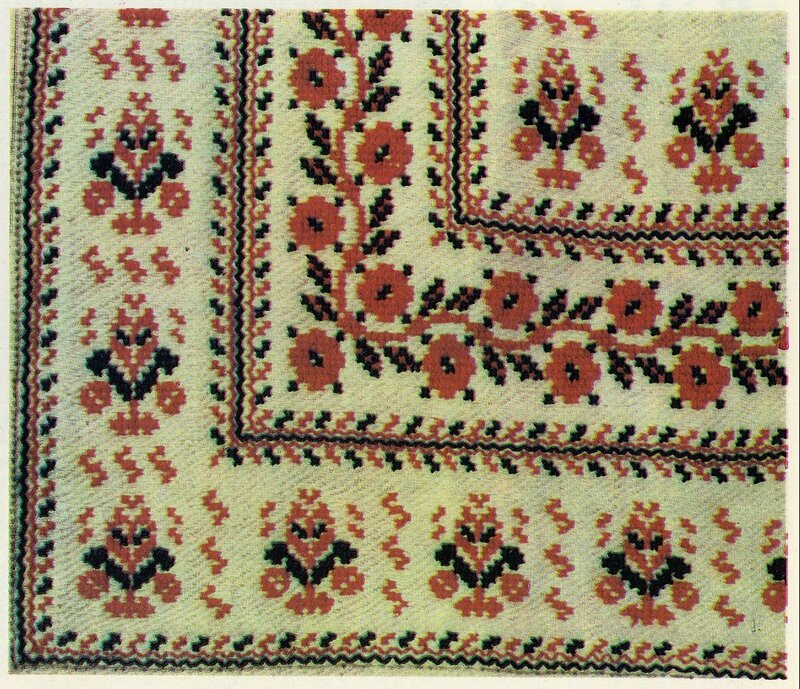 It was originally done just on the bawnytsia, the headpiece, and consists of rows of herringbone, with braid stitch, and designs in flat stitch, back stitch, and a few cross stitches between groups of herringbone. Here is an example of a bawnytsia. This garment is never embroidered in any other technique. This style of stitching is distinctive and very pleasant. 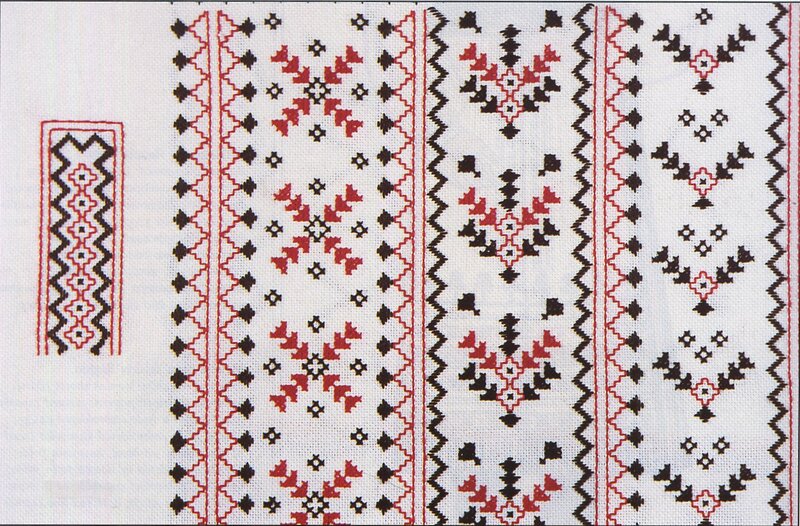 It has become popular all over Ukraine for table linens and many other items. Here is an example. Here are a few Javoriw stitching patterns graphed out. 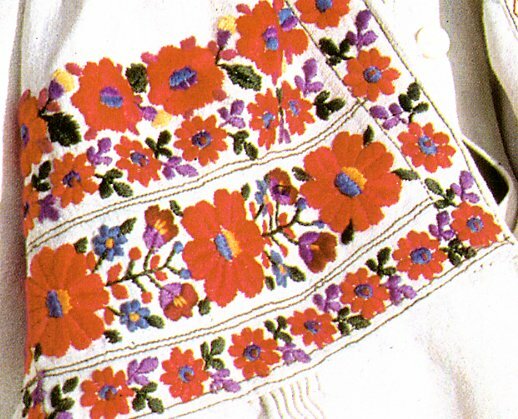 This type of stitching is also done on the chemise, but never on the apron or the outer garments. Here is a chart of the embroidery of a shoulder inset done by Krawchuk. You can see that it is combined with back stitch, braid stitch and cross stitch as well. 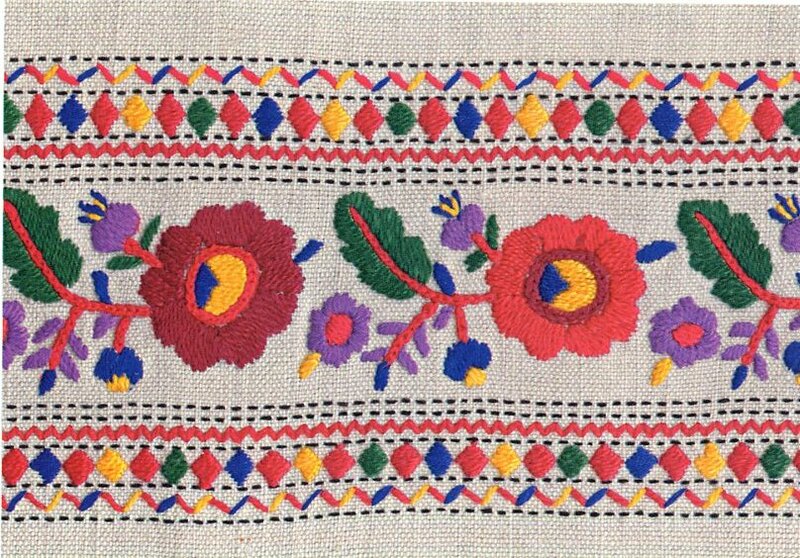 The last type of embroidery done in Jaworiw is Haft, that is, free satin stitch with stem or braid stitch. 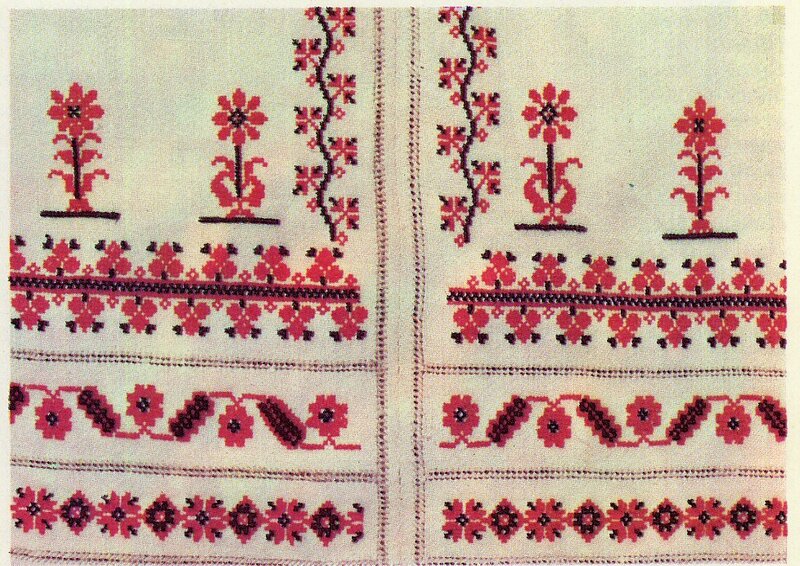 Here is an old example which shows continuity with the embroidery of neighboring Horodok county. This is very fine work. 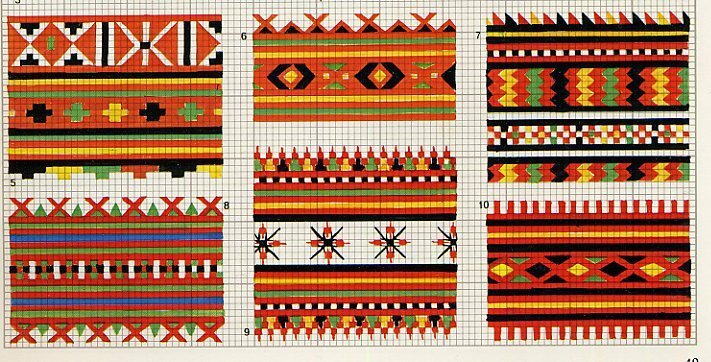 This is the design on the bottom edge of a woman's shoulder insert. Haft is done more commonly in Javoriw than in neighboring counties. When the kabat and the kamizelka came to be made in wool or factory made cloth, the primary type of embroidery done on them was haft. Here are a couple examples. 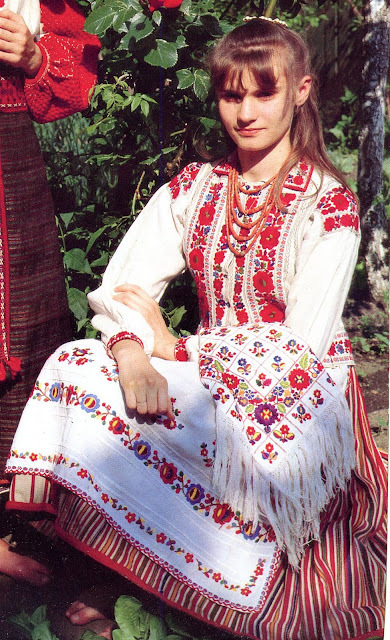 As you can see, the chemise has come to be embroidered in this style as well. Here are a couple examples of such chemises. This is obviously not counted thread embroidery as the others are. 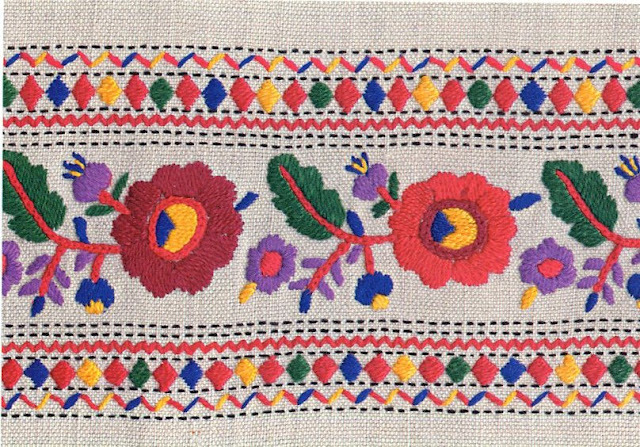 The composition is typical of the region, featureing large open flowers, similar but distinct from Hungarian designs. This example above seems to be framed by maching stitching. Here are a couple of collars done in this style of embroidery. This has been adapted to table linens and pillowcases. Here is a closeup of one such piece. The kerchiefs, which originally were done in cross stitch, are often done in haft now as well. Here are a few examples. ﻿This type of embroidery can also be done on fine woven store bought cloth as you can see from this last photo. I have even found one example of the apron being done in haft That is unusual, but is done, as we can see from this last photo. All of the embroidery she is wearing, on apron, kerchief, chemise and kamizelka is done in haft. 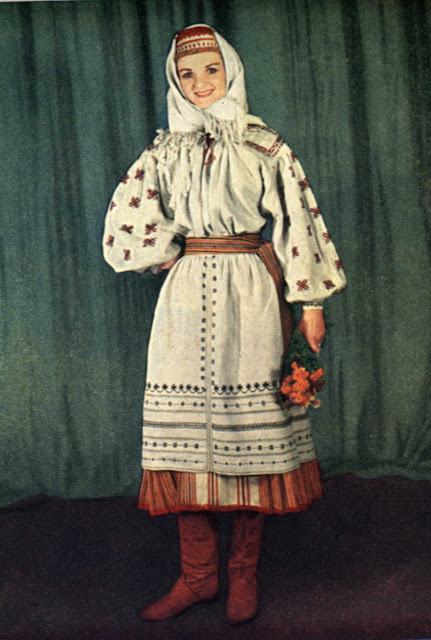 She is not wearing a bawnytsia, which would not be done in this technique. Thank you all for reading. I hope that this may inspire you to make something beautiful. Feel free to contact me with requests for research, or commissions for research-design, sewing or embroidery projects. 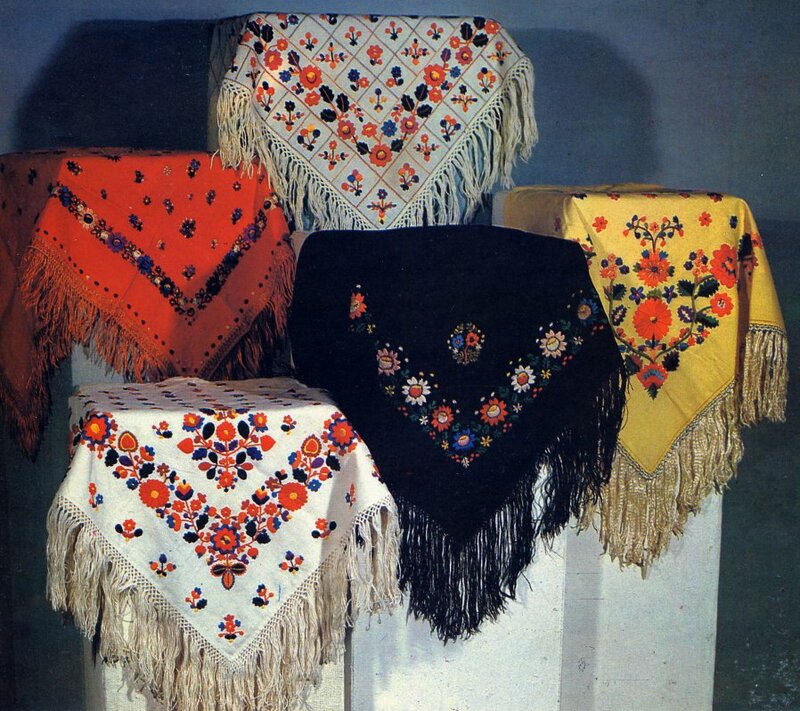 i am looking to have a contact so i can buy traditional Hungarian, Ukranian our Romani wool head scarves. Could you give me a help! I am looking our for a Fabric that produces them our a Store? It would be lovely if you could give me a contact from a Company Fabric that produces them.